My golf foursome, three great women to spend time with. Lawai Beach, green sea turtle sanctuary. I play golf with a foursome (above) who get together about once a month and play at a private course in Poipu called Kukui Ulu. It's so gorgeous it's hard to keep your mind on the golf. The ninth hole is spectacular but very difficult. As you can see, you don't want to come in too fast on that hole. But overlooking the green on the thirteenth hole is the magnificent Lawai Beach. You can get there two ways. The first is frowned upon but if you anchor your boat in the harbor you can swim in. The other way is to buy a ticket to the Allerton Garden tour, one of the best things to do on Kauai. The Allerton house is set back further upstream. What's unique about this particular beach is that it's a sanctuary for green sea turtle breeding. While most beaches in Kauai are open to everyone, this one is only for the turtles who lay their eggs in the sand. They lay about 100 eggs each and two months later the little guys hatch and make a dash for the open water. They are endangered so that particular beach is off-limits to all but the turtles and the volunteers who watch out for them. This is a mahogany hibiscus. 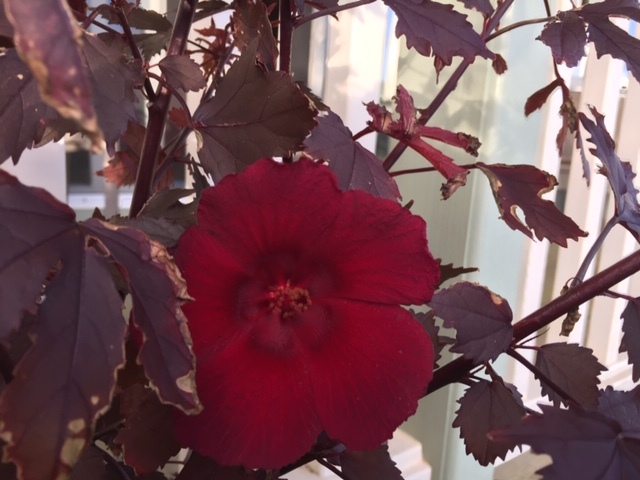 The flowers are deep red and the leaves and stems are reddish-brown. I put some cuttings in a small pot and within about a year it was six feet tall. It's loaded with deep red flowers that many people dry and reconstitute for mixing into tea or use for cooking. Before you start one you must beware of its potential to travel around your yard. It will send runners along the ground and before you know it you have a hedge.